Interferon Regulatory Factor-3 (IRF-3) plays a central role in the induction of interferon (IFN) production and succeeding interferon-stimulated genes (ISG) expression en route for restraining hepatitis C virus (HCV) infection. Here, we established a stable Huh7.5-IRF3ER cell line expressing a fusion protein of IRF-3 and mouse estrogen receptor (ER) to examine IFN production and anti-HCV effects of IRF-3 in retinoic acid inducible-gene-I (RIG-I) deficient Huh 7.5 cells. Homodimerization of the IRF-3ER fusion protein was detected by Western blotting after treatment with the estrogen receptor agonist 4-hydrotamoxifen (4-HT) in Huh7.5-IRF3ER cells. Expression of IFN-a, IFN-b, and their inhibitory effects on HCV replication were demonstrated by real-time polymerase chain reaction (PCR). Peak expression of IFN-a and IFN-b was achieved 24-hours post 4-HT treatment, coinciding with the appearance of phosphorylated signal transducer and activator of transcription (STAT) proteins. Additionally, HCV viral replication declined in time-dependent fashion. In previous studies, a novel IFN-mediated pathway regulating expression of 1-8U and heterogeneous nuclear ribonucleoprotein M (hnRNP M) inhibited HCV internal ribosomal entry site (IRES)-dependent translation. 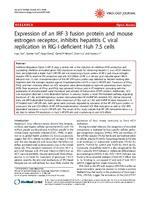 When expression of ISGs such as 1-8U and hnRNP M were measured in 4-HT-treated Huh7.5-IRF3ER cells, both genes were positively regulated by activation of the IRF-3ER fusion protein. In conclusion, the anti-HCV effects of IRF-3ER homodimerization inhibited HCV RNA replication as well as HCV IRESdependent translation in Huh7.5-IRF3ER cells. The results of this study indicate that IRF-3ER homodimerization is a key step to restore IFN expression in Huh7.5-IRF3ER cells and in achieving its anti-HCV effects. RESEARCH OpenAccessExpressionofanIRF-3fusionproteinandmouse estrogenreceptor,inhibitshepatitisCviral replicationinRIG-I-deficientHuh7.5cellsLuyuYao1,XiaoboYan4,HuijiaDong2,DavidRNelson3,ChenLiu2andXiaoyuLi1*AbstractInterferonRegulatoryFactor-3(IRF-3)playsacentralroleintheinductionofinterferon(IFN)productionand succeedinginterferon-stimulatedgenes(ISG)expressionenrouteforrestraininghepatitisCvirus(HCV)infection. Here,weestablishedastableHuh7.5-IRF3ERcelllineexpressingafusionproteinofIRF-3andmouseestrogen receptor(ER)toexamineIFNproductionandanti-HCVeffectsofIRF-3inretinoicacidinducible-gene-I(RIG-I) deficientHuh7.5cells.HomodimerizationoftheIRF-3ERfusionproteinwasdetectedbyWesternblottingafter treatmentwiththeestrogenreceptoragonist4-hydrotamoxifen(4-HT)inHuh7.5-IRF3ERcells.ExpressionofIFNa IFNb,andtheirinhibitoryeffectsonHCVreplicationweredemonstratedbyreal-timepolymerasechainreaction (PCR).PeakexpressionofIFN-a andIFNb wasachieved24-hourspost4-HTtreatment,coincidingwiththe appearanceofphosphorylatedsignaltransducerandactivatoroftranscription(STAT)proteins.Additionally,HCV viralreplicationdeclinedintime-dependentfashion.Inpreviousstudies,anovelIFN-mediatedpathwayregulating expressionof1-8UandheterogeneousnuclearribonucleoproteinM(hnRNPM)inhibitedHCVinternalribosomal entrysite(IRES)-dependenttranslation.WhenexpressionofISGssuchas1-8UandhnRNPMweremeasuredin4HT-treatedHuh7.5-IRF3ERcells,bothgeneswerepositivelyregulatedbyactivationoftheIRF-3ERfusionprotein.In conclusion,theanti-HCVeffectsofIRF-3ERhomodimerizationinhibitedHCVRNAreplicationaswellasHCVIRESdependenttranslationinHuh7.5-IRF3ERcells.TheresultsofthisstudyindicatethatIRF-3ERhomodimerizationisa keysteptorestoreIFNexpressioninHuh7.5-IRF3ERcellsandinachievingitsanti-HCVeffects.IntroductionHepatitisCvirusinfectioncauseschronicliverdiseases, cirrhosis,andhepaticcellularcarcinoma(HCC)with170 millionpeopleworldwideand4millionpeopleinthe UnitedStatesreportedlyin fected(CDC,1998).Inadditiontoitsglobalhealthproblem,futureprojections suggestthatHCVrelatedmortalitywillincrease2-3-fold overthenextdecadewithmorethan180billionUS dollarsestimatedtotalsocialeconomiccostintheUnited States.ThestandardtreatmentofchronicHCVis anti-viraltherapywithIFNandribavirin(RBV)butno HCVvaccineavailable.DespiteadditionalchemotherapeuticsisonhandfortreatmentofgenotypeIHCV patientsrecently,theanti-viralmechanismsofIFN-based therapiesarenotwelldefined,butmostlikelyinvolvethe activationofhostinnateimmunitytolimitHCV replication. Duringmicrobialinfection,therecognitionofmicrobial componentsismediatedbyhost-specificcellularpathogen-recognitionreceptors(PPRs).PPRsaremembersof thetoll-likereceptor(TLRs)familyandarelocalizedeither tocellularplasma(TLR4forlipopolysaccharide(LPS)and viralenvelops)orendosomalmembranes(TLR3for dsRNA,TLR7/8forssRNAandTLR9forDNA[4-7]). Conversely,intracellulardsRNAisalsorecognizedbythe RIG-IcytosolicRNAhelicaseormelanomadifferentiation associatedgene(MDA)-5.RIG-IRNAhelicasewas foundtobeanessentialmediatorofanti-HCVeffectsdue toitsbindingtoun-capped5 -endand3 -endHCV dsRNA,triggeringhostinnateimmunity. IFNsbindtotheIFNa / b receptor(IFNAR)ineitheran autocrineand/orparacrinemannertoinitiateapositive feedbackloopthatresultsintheproductionofmoretypeI IFNs.IFNARstriggertheactivationoftheJAK/STAT *Correspondence:Xiaoyu.li@jax.ufl.edu1DivisionofGastroenterologyandHepatology,DepartmentofMedicine, UniversityofFlorida-Jacksonville,FL32206,USA FulllistofauthorinformationisavailableattheendofthearticleYao etal VirologyJournal 2011, 8 :445 http://www.virologyj.com/content/8/1/445 2011Yaoetal;licenseeBioMedCentralLtd.ThisisanOpenAccessarticledistributedunderthetermsoftheCreativeCommons AttributionLicense(http://creativecommons.org/licenses/by/2.0),whichpermitsunrestricteduse,distribution,andreproductionin anymedium,providedtheoriginalworkisproperlycited.